One of the most exciting things about home theater and audio in general is that it's always evolving. Back in the '80s when home theater first started, LaserDisc with two channel audio was the best technology available for consumers. These days with 4K Ultra HD content and receivers that can support up to 13.2 channels with Dolby Atmos, the state of the art is constantly being pushed forward into new territory. Here at Aperion we are always striving to not only stay on top of current trends, but also looking to the future in order to anticipate what is likely to happen next. With that in mind, here are a few of the developments that we think will be coming down the pike in the next few years. As we mentioned, right now you can get a couple of units capable of 13.2 channel processing, namely the Denon AVR-X8500H receiver and the Marantz AV8805 pre-amp, which will allow either 7.2.6 or 9.2.4 speaker configurations. Which means you can either have a 7.2 system with six Atmos or height channels or a 9.2 system with width channels up front and four Atmos or height channels. The thing is though that Atmos encoding can actually support up to 24.2.10 configurations! That's right, there's the potential for up to 24 channels spread across the fronts, center(s) and surrounds and then up to 10 height channels. And you can bet that the next generations of receivers will start tapping into these capabilities. While it may sound like overkill to have 20+ speakers in your home theater, it's all relative. Back when 7.1 was first being adopted during the DVD era people said that the same thing. 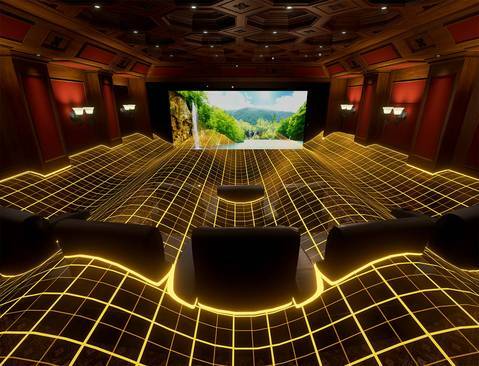 Eventually though 7.1 became the norm, especially for people with larger home theater rooms. While it may take a while for home theaters with true 3D sound to become widespread, it seems inevitable that setups featuring double digit channels will become more common. Here at Aperion HQ our 7.1.4 setup sounds incredible and we can't wait to add more channels! This one is well under way with smart speakers and many TVs already featuring voice control with protocols like Amazon Alexaand Google Assistant and it's even starting to spread to some A/V Receivers. However, right now you can only use an Alexa or Google Assistant enabled device to "talk" to the receiver and control it. But it's only a matter of time before they start integrating these technologies right into receivers themselves. When that happens you'll no longer need to have an extra device as a go-between and can tell your receiver what you want it to do directly. Similarly, right now you can use an Alexa device in conjunction with a product like the Harmony Hub to control your system, up to eight devices at least, via voice command. However it's a bit of a hassle to set up and it works through IR signals so everything needs to be line of sight. But one day in the future you'll be able to use voice control through devices that are all connected to your WiFi network. Everything completely integrated into one system with each piece being connected to one another through WiFi, that's some truly powerful tech. Imagine being able to control the volume of a whole house audio system, simply by speaking into your phone and without any extra hardware. That day is not far off. 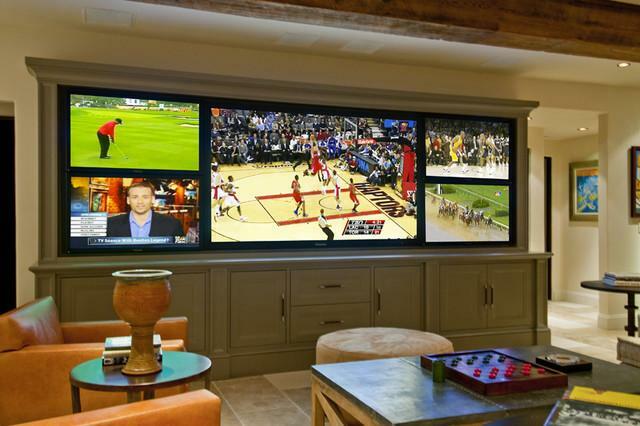 We admit that we are getting into Fahrenheit 451 territory here, but additional screens in a home theater or media room is becoming a feature more and more people are installing. This is especially the case for sports fanatics, who want to be able to watch more than one live event at once, essentially rendering the concept of a screen inundated sports bar obsolete. It's sort of a parallel version of what is happening with larger and larger Atmos enabled speaker systems, but with the key distinction being that multiple screens will give folks the ability to consume more than one media offering at once. There are already A/V receivers out there that allow for output to two monitors via HDMI simultaneously, it will be interesting to see if this trend becomes common enough that we see three or even more outputs on new models. Sure turning your living room into mission control isn't going to be for everyone, but as display tech gets cheaper and cheaper, we can definitely see more than one screen in a room becoming more prevalent. Over on the strictly audio side of things, streaming continues to dominate the way people listen to music. Because of that, Bluetooth speakers are becoming a very common method to listen to those audio streams conveniently and with a minimum of hardware. In the past those Bluetooth speakers have not been very high quality, and often times it seemed that "better than your phone" was the only real bar that needed to be surpassed. But that is quickly changing, with more speakers offering higher levels of performance, including our own Allaires. In addition to Bluetooth speakers that offer increased sound quality another emerging trend is larger form factor products that can provide sound that is at a higher decibel level and more bass extension. Since Bluetooth speakers are going to continue to be utilized by larger amounts of people and in a wider variety of environments, the movement toward speakers with bigger drivers and even three way designs will probably persist. Will we hop on the bandwagon of a monster Bluetooth speaker to really rock your next party? Stay tuned! This one's probably a bit far off still, but with virtual reality broadcasts beginning to crop up last year for NBA games, it seems like there is a push to make VR programming the next big thing. Of course 3D programming never took off and there still seems to be little interest in 3D Blu-Ray, so it's hardly a foregone conclusion that VR will really see widespread adoption. At least when it comes to non-gaming platforms. But with a lot of money being invested by the likes of Facebook in the Occulus Rift and Google trying to make augmented reality happen with the Magic Leap, there is a fairly good chance that the same technology will be applied to other platforms like broadcasts and movies. VR is one of those technologies that seems to be talked about every 10 years or so with it never quite coming to fruition. One of these days though it just may breakthrough to mainstream usage. Being able to feel like you are courtside at an NBA game (without the $12 beer) or inside the Millennium Falcon cockpit with Chewie and Han sure sounds like a dream come true to us. Pair that with an immersive Atmos type system and it could usher in a whole new level of home entertainment.